Today, globalization is unstoppable, making it the norm that people from diverse cultural backgrounds work and live together on a daily base. At the same time, we all know that trust is the foundation of long lasting and successful partnerships. But how can we build that trust when we don’t understand the covert cultural signals being sent? China, the Middle Kingdom, opened its doors to the world more than 30 years ago and has developed into one of the largest economic centers of the world. However, for many westerners, this country, its people and culture remain mysteriously hidden like something of a closed book. In January our member Hong Hong Xu gave us a presentation on Chinese Culture. We began the day by celebrating the year of the Red Rooster. Then Hong-Hong Xu provided an eye-opening look into the world of Chinese Culture helping us to see just how hard it can be to bridge the culture gap even with the best of intentions. She showed us, with clear examples and her own story, the awareness and determination it takes to choose to adapt in a world with different values. 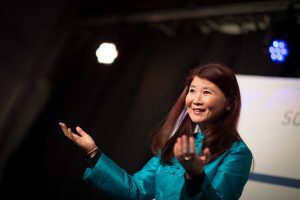 At the same time Hong-Hong underlined a universal truth – that we can often learn the most by overcoming difficult challenges and rising to new understanding of our self and our potential. Many thanks to Hong-Hong for the great presentation and the lovely gift for all the participants! Ms. Hong Hong Xu was born in Beijing, has been working and living in both China and Germany since 1988. She holds a Master of Engineering in Materials Science from Technical University Darmstadt (1995) and MBA from University Mannheim (2000). She is senior manager at BASF SE.